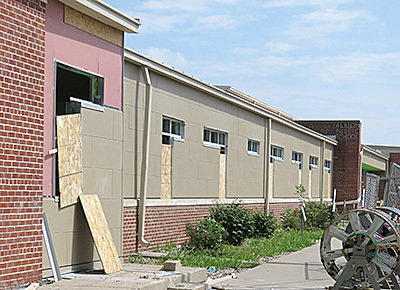 Exterior windows and panels were being completed on the elementary wing this week. 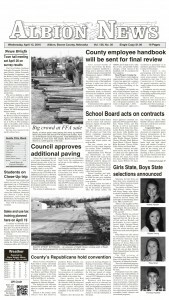 Boone Central School construction was down to the final four weeks by Monday, July 31. High school and middle school classes are set to start Aug. 30, and elementary classes will begin Sept. 5. There is a lot of work left to do, but site manager Bruce Niessen said good progress is being made. An average of 98 people per day have been working on site, logging about 950 man hours per day, for the past four weeks. In the elementary wings, where demolition was completed about eight weeks ago, all concrete has been poured, and Niessen said he expects all drywall to be hung by the end of the week. All exterior window frames have been installed. Primary structural work has been completed in the new construction area on the east. This includes the new gym, kitchen, commons area, snack bar, restrooms, administrative offices, locker rooms, weight room and wrestling room. Niessen said he was expecting a final State Fire Marshall inspection of this area by Thursday, Aug. 3. Read more in the Aug. 2 Albion News & Petersburg Press, Print and E-Editions.